Don't use EurekaLog IDE expert? This dialog allows you to edit global EurekaLog options. There is also another options dialog, which allows you to set per-project settings for EurekaLog - it's located under Project / EurekaLog options (see also). The IDE options dialog works like any other dialog with OK and Cancel buttons. These options are stored in the registry (under HKEY_CURRENT_USER). "Yes" button will open your default browser on EurekaLog's site, where you can get a new version of EurekaLog. You can continue to work in IDE. "No" button will just continue work without opening browser. 2. "Catch EurekaLog IDE Expert errors" option installs hooks in IDE to catch problems within EurekaLog IDE expert. When this option is enabled: each unhandled exception for EurekaLog IDE expert will generate bug report which can be send to developers (us). 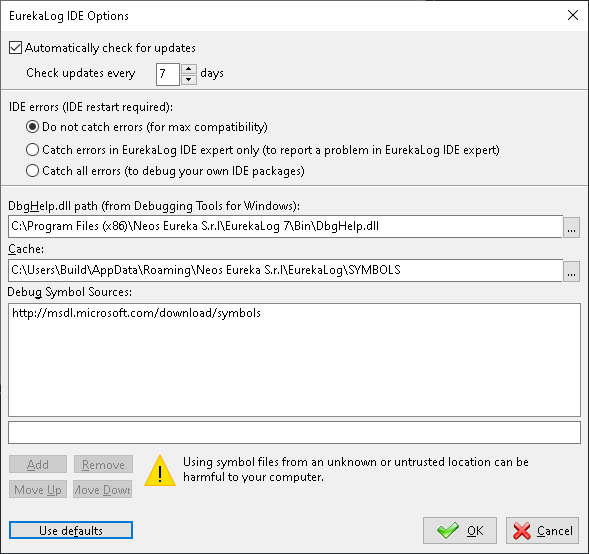 Exceptions for IDE itself and for other extensions are not changed. 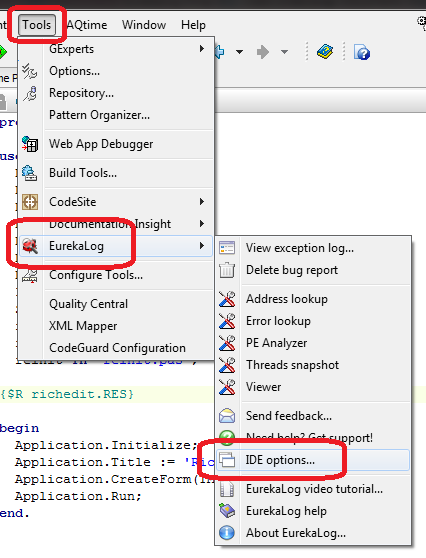 When this option is disabled: any unhandled exception for EurekaLog IDE expert will generate a simple error dialog only (message box) without bug report and additional info. Enable this option to create bug reports about problems in EurekaLog (you can send these reports to us). Disable this option to improve EurekaLog IDE expert speed (only a little) and to improve compatibility with other 3rd party software. Note: you need to restart IDE for this option to take effect. 3. "DbgHelp.dll path" option specifies full file name to DbgHelp DLL. You can find it in EurekaLog's installation folder (like: C:\Program Files (x86)\Neos Eureka S.r.l\EurekaLog 7\dbghelp.dll). You can also change this path to alternative library. This is DLL from Debugging tools for Microsoft Windows. It's used in MS Debug stack tracing method and MS Debug info provider. 4. "Cache" option specifies read-write folder to be used as cache for debug info symbols. It's empty by default, which means disabled feature. You can click on "Use defaults" button to set default preference (which is sub-folder in your %APPDATA%, for example: C:\Users\User\AppData\Roaming\Neos Eureka S.r.l\EurekaLog\SYMBOLS) or select your own folder. Be sure that this folder is writable and disk have some free space (up to 500 Mb). This cache folder is used by MS Debug info provider to store debug symbols for system libraries. 5. "Debug symbol sources" option specifies debug info sources for MS Debug info provider. You can add one or more sources here by using edit-box and buttons below. Source can be local folder (like: C:\Symbols), shared network path (like: \\server\symbols) or URL of symbol's server (like: http://server/symbols). It's empty by default, which means disabled feature. You can click on "Use defaults" button to set default preference (which is default Microsoft's symbol server: http://msdl.microsoft.com/download/symbols) or select your own sources.